Brian Williams at an event in New Jersey in 2014. NBC's Brian Williams addresses the crowd while moderating a debate in 2008. 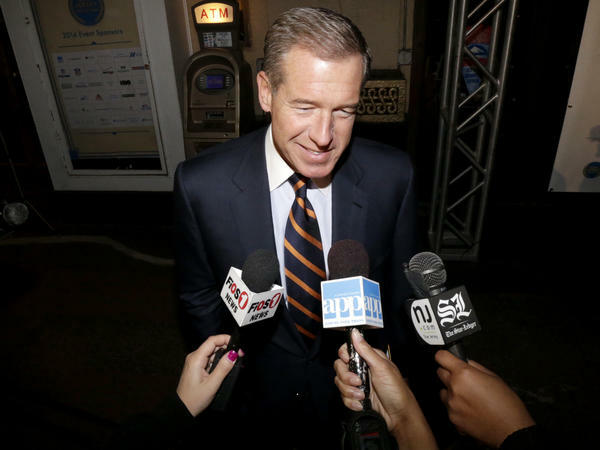 NBC has worked out a deal to keep tarnished news anchor Brian Williams at the company, sending him to MSNBC to serve as anchor of breaking news and special reports. But this brings a new question: How, exactly, can NBC get viewers to trust him again? Williams has experienced perhaps the quickest fall in the history of TV journalism. Once TV's top-rated network news anchor, leading the NBC Nightly News, he was suspended without pay for six months just days after apologizing for saying he was aboard a helicopter forced down by enemy fire in Iraq when he wasn't. The scandal prompted NBC to bring back a former head of the news division to take the reins again; the network also opened an internal investigation into Williams' statements. Now NBC has released a statement confirming earlier press reports that Williams' replacement, Lester Holt, will be the permanent anchor of NBC Nightly News. Williams will move to MSNBC in mid-August to boost its news coverage efforts, also anchoring live events for NBC News when Holt isn't available. This compromise keeps Williams from going to a rival network while avoiding a firing (though the New York Times reports he is expected to earn much less than his pre-suspension, $10 million annual salary). As an interesting bonus, Holt makes history as the first black man to serve as permanent solo anchor for a network newscast — essentially becoming the face of NBC's news division. With the lawyers satisfied, the hard part begins: turning Williams from a punchline back into an effective news anchor. Here's one TV critic's take on what that might look like. Step 1: Williams admits what he did wrong. As CNN's Brian Stelter first reported, NBC says Williams has taped an interview with Today show host Matt Lauer that will air Friday morning on Lauer's show and Friday evening on Nightly News. In its statement on the anchor changes, NBC includes a long quote from Williams, who said, in part, "I'm sorry. I said things that weren't true. I let down my NBC colleagues and our viewers, and I'm determined to earn back their trust." But the statement's mea culpa may not be enough. Since Williams' suspension, there have been many leaks from people close to the situation: that the anchor had a frosty relationship with predecessor Tom Brokaw, that he asked for a chance to take over the Tonight Show and that he felt constrained working solely in news. Williams will probably have to apologize in more detail and explain away some of these reports, mostly to keep other journalists from constantly asking about them and to convince viewers he's back on track. MSNBC is the place where Williams was first groomed to succeed Brokaw. To move on again, he'll probably have to explain how he wound up back there and why he shouldn't have been fired outright. Step 2: NBC releases some version of its internal report on his misstatements. This is tricky. NBC referred to the internal investigation in its statement on the changes. It said: "The extensive review found that Williams made a number of inaccurate statements about his own role and experiences covering events in the field. The statements in question did not for the most part occur on NBC News platforms or in the immediate aftermath of the news events, but rather on late-night programs and during public appearances, usually years after the news events in question." If the network doesn't release some version of its internal report on Williams' exaggerations, tabloid outlets such as TMZ and Gawker may devote significant resources to getting hold of it, keeping NBC from controlling the story. The Washington Post's Paul Farhi has reported there is a video compilation of Williams' exaggerated stories that some NBC executives have seen, for instance. But if the report is too damaging, releasing it could make Williams' credibility problems worse. That's what happened to CBS Evening News anchor Dan Rather in 2004 when CBS hired high-profile investigators to look independently into how 60 Minutes Wednesday aired a problematic story he reported about President George W. Bush's National Guard service. CBS's panel issued a 224-page report that accused CBS News of not following basic journalism principles and using documents despite serious questions about their authenticity; four staffers were ousted and Rather left his anchor post not long after. So depending on what NBC's investigation found, the network will likely have to be careful about what it discloses — particularly if the goal is to rehabilitate Williams' image. Step 3: Williams gets a substantial role at MSNBC. In his new role at MSNBC, Williams will need to be seen as anchoring reports that are accurate, trustworthy and impactful. 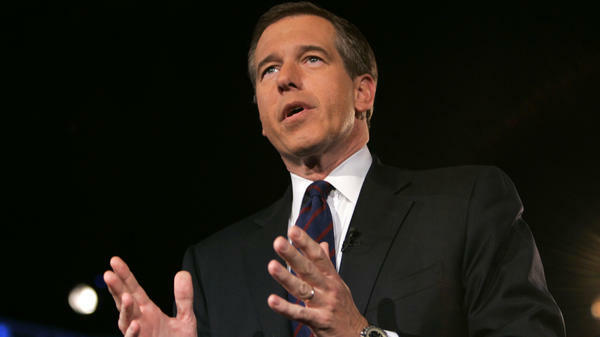 The image of Williams that emerged during the scandal was of a news personality willing to stretch the truth for a good story on a talk-show couch. His work at MSNBC will have to counter that picture immediately and for the long term. NBC and Williams also have to show that he isn't suffering the same fate as Ann Curry. Curry was pushed out as co-anchor of the Today show in 2012, bidding a tearful goodbye on-air that created a huge controversy for NBC News. Instead, she became an anchor-at-large and wide-ranging correspondent for the network — a lofty title that didn't bring nearly as much airtime. Industry watchers will be looking closely to see whether NBC is benching Williams in a similar way. If that's not the intent, his new position will have to communicate that quickly. Step 4: Williams lands on MSNBC prime time. When the anchor was suspended in February, many experts predicted the safest course for NBC would be to boost MSNBC's prime-time ratings by moving him there. The open question: What kind of show would he lead? The network tried giving Williams a showcase in NBC prime time with the news magazine Rock Center. But the program was dogged by low ratings amid criticism that the anchor was too stiff and its stories weren't distinctive or impactful enough. It lasted just two years, canceled in 2013. Could a new MSNBC show in prime time allow Williams to show off the wit that made him a talk-show favorite while delivering the kind of news programming the cable channel needs and boosting ratings? That's just one of the many questions and challenges on the horizon, now that NBC has decided to stay in the Brian Williams business a while longer.